Seattle Animal Shelter (SAS) has agreed to allow Dr. James C. Ha, Certified Applied Animal Behaviorist to conduct an independent evaluation of Jenny. Jenny is the property of the City of Seattle. Jenny is not to be in contact with anyone besides us until evaluation. Jenny must wear a muzzle whenever we are outside our apartment. We cannot be present for the evaluation. Update 07/21: Dr. Ha to arrange evaluation directly with us. Time/place TBD. Update 07/31: Dr. Ha evaluated Jenny at our home. We will accept the outcome of Dr. Ha’s evaluation. SAS will make the final decision. June 20 — Emailed Laura Mundy (Foster Care Coordinator) and Kara Main-Hester (Jenny’s Case Manager) to ask why Jenny has not been listed on Old Dog Haven and to ask for foster transfer by end of July. Reported that Jenny air snapped a woman’s skirt, is reactive to some people in uniforms, and requested pain medication for her arthritis. Later in the afternoon, Laura called to tell us that SAS reviewed the situation and Jenny is no longer a safe adoption candidate and should be euthanized within a week. June 21 — Sent SAS three-page report about Jenny’s behavior, detailing positive and negative characteristics, listed all incidents of air snapping and ways to manage concerns, including foster parent burn-out. Told SAS that we did not believe that Jenny should be euthanized. Asked to adopt Jenny. June 22 — Contacted animal organizations including Seattle Humane Society, Homeward Pet, King County. June 23 — Sent SAS statements from others in our community about Jenny’s behavior and restated that we cannot support euthanasia. Asked to adopt her or transfer her to another organizations. This decision is for the shelter to make, and while I know you have Jenny’s best interests at heart, we have to also think of the community around you. I wish Jenny was a happier dog, but there are just some dogs that need more than we can offer. June 24 — Jenny evaluated by certified professional dog trainer, Judith Anderson-Wright of Great Dog. Report sent to SAS. Katie Olsen from Seattle Humane Society wrote to say that their transfer team will reach out to SAS to learn more about Jenny and to see if they can offer any additional rescue/sanctuary contacts for them to pursue. June 25 — Spoke to Katie Olsen about Jenny, she said, All dogs can be managed. Seattle Humane Society willing to assist with evaluation and training only if SAS allows us to adopt. Don Baxter emailed to say that SAS will not seek a transfer of Jenny to Seattle Humane Society or any other organization. Insists that Jenny be returned to the shelter. We requested an in-person meeting with Don Baxter and Laura Mundy. June 26 — Contacted Dr. Wailani Sung to request a behavior evaluation. Contacted Alternative Dispute Resolution Program at City of Seattle. June 29 — Contacted Attorney Adam Karp to discuss options for Jenny. Submitted adoption application to SAS. SAS rejects our application to adopt. Asked if Attorney Adam Karp can review laws and negotiate an adoption contract with John Schochet at the City Attorney’s Office to address liability concerns. July 11 — Don Baxter called to say that he spoke to Don Jordan and the City’s Attorney and we cannot adopt. We asked if they would consider the accounts of the recipients of Jenny’s air snapping. He said no. Jenny must be returned to the shelter by Monday. We worked for 36 hours straight to launch Save Jenny Dog campaign — website, social media, flyers, video, community voices. July 13 — Don Baxter called to say that there will be no more discussion and Jenny must be returned to SAS today. At 4:20 pm, SAS animal control officers came to our apartment unannounced. We did not open the door. July 14 — jennydog.co visited by over 2,000 people. Received dozens of messages of support and offers of help, including from former SAS volunteers whose animals were also euthanized. Other rescue organizations contact SAS to negotiate transfer. Afternoon: Don Baxter left voicemails asking to discuss Jenny. July 15 — Don Baxter called to say that SAS will conduct an outside assessment. He did not acknowledge community protest / input or the information provided on this website. (He said that he has not seen it.) Restated that Jenny is the property of the City of Seattle and it’s their decision. July 18 — Dr. Wailani Sung will not provide behavior evaluation without permission from SAS. July 31 — Dr. Ha evaluated Jenny at our home. Jenny showed no fearful, anxious, or aggressive behavior. High probability of undiagnosed medical issues. August 5 — Meeting with SAS. We are allowed to adopt! August 15 — We receive a copy of Dr. Ha’s evaluation. August 18 — SAS releases a statement about Jenny. August 26 — SAS sends us adoption agreement! You cannot be so cold hearted,that you will kill Jenny the dog in these circumstances. Remember , Jenny has not hurt no one , so please reconsider! Please reconsider for Jenny’s sake. Amie and Olli are willing to take over her responsibility and they should be allowed to adopt her. Any future actions from Jenny would be on their heads and not the shelter so I don’t see why there would be a problem. This is not a dog documented for attacking anyone and there is no call to euthanize. Please let them adopt! The foster system relies untrained volunteers. Foster families should not be afraid to turn to the shelter for support in helping to rehabilitate a dog that has been abused or is scared in its new environment. If the shelter was first made aware 2 weeks ago then I would have expected the shelter to step in to give the foster family the support they needed to help Jenny or transfer Jenny to another foster that could give her the training that would help her. She has been with a family since November and yet it is only in the last two weeks she has been deemed a danger? Three weeks ago she was a safe adoption candidate. 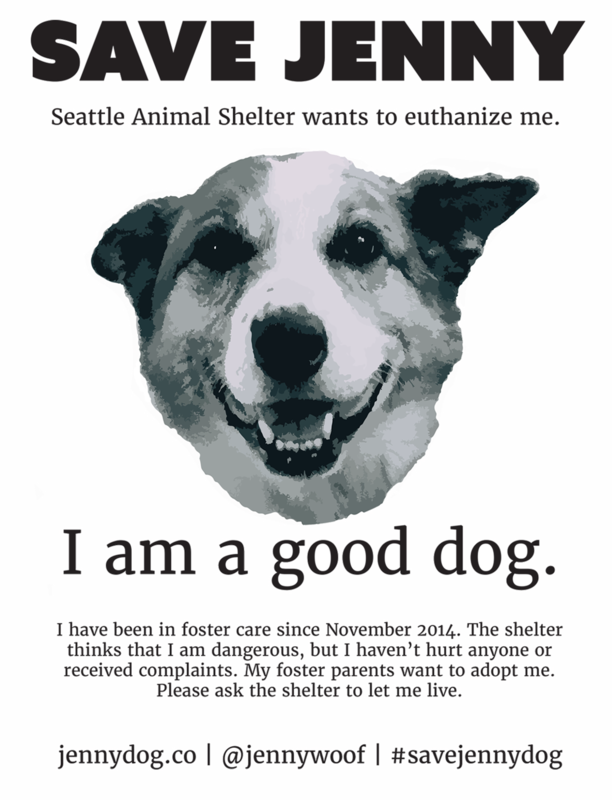 I have often spoken highly of the Seattle Animal Shelter. I have encourage many people to foster, to participate in the Furry 5K and the other shelter fundraisers. But this case has made me reconsider my position entirely. There was no concern about Jenny as a threat to the community. These seem to be very small and minor actions. Air snaps are a dogs way of saying hey leave me alone right now, just as a cat batting at you trying to keep you at bay when they want to have some space. If Jenny has any type of herding dog in her blood like Austrian Blue or Red heeler, then their natural reaction is to air snap or nip to herd animals. I feel if there was any concern in her behavior the Animal Shelter should have asked to have her go to classes to help her with her anxiety. I also know when animals are in pain they are usually on guard and will naturally react in a way that is defensive. Jenny does not deserve to die and deserved to be given a fair chance and fair treatment for her pain. Please call the Animal Control today 12pm-6pm to voice your opinion (206) 386-4294. Her voice is only heard through ours! Let’s give her a chance for a life of love! Jenny needs another chance. All these people who have encountered her, you people need to listen to them. She does not sound like the kind of dog who should be put down. Her people sound great and they love her, that’s what she needs to feel safe and cared for… please give her another chance!!! Have them put her through some obedience training/classes, that’s good for her and helps establish a closer bond with her people. She really does deserve another chance… thank you for listening to someone who has had dogs (and cats) for 70 years… and has only been bitten by cats who BTW were never put down. This flyer caught my attention at a neighborhood bar. I am an owner of a rescue who was nervous and skittish for the first year of her life with me. It took a lot of time and care to get her to where she was comfortable around other people as well as other dogs. I believe Jenny can be healed of her past emotional wounds with the help of loving and patient parents. Please reconsider your decision to euthanize this helpless animal. I admire Jenny’s humans for their fight on behalf of Jenny. I also have a rescue dog, and when I first got her, she was often super shy and skiddish around other people. It took her some time to become comfortable with everything in her new life. The Humane Society – who I can’t speak highly enough of – told me it would take a year for her to become completely comfortable – and that’s exactly what happened. While my dog still has a tendency to air snap when she wants to be left alone during her down time, it’s taken a lot of love, patience and affection to get her to be less reactive when on the leash – around other dogs and people. Her background is a mystery to me and a little love, trust and compassion has gone a long way with her. Jenny needs the chance to experience this herself. Please give Jenny a chance. She’s getting used to her new life, and new humans. She’s surrounded by people that have an incredible out pouring of love for her – people who want to help her be the best dog she can be. Have a little heart, and a little faith, and please save Jenny. It seems to me that this poor dog is not a threat to anyone, especially when she has two owners who clearly care so much about her development and training. All dogs deserve a chance! I’m sure Jenny will be a great addition to the community especially as she continues to adapt to her surroundings. LET JENNY LIVE! 1.) Even if they are convinced they are correct in their assessment that she is dangerous, they had the information months ago, and did nothing about it. So, theoretically, by their logic, they let a dangerous dog live among people for months because they hadn’t yet assessed the situation? How embarrassing is that? 2.) They did not, even with previous knowledge of her issues, mandate training for her with her foster parents or mandate safe handling protocols. That is the absolute LEAST they could have done. 3.) They, when confronted about their questionable decision, decided to do the least mature thing possible by not even attempting to use a behaviorist for assessment as second opinion until a PR campaign was waged and they were inundated with negative press. 4.) I already covered this, but it’s worth pointing out again, that they did NOTHING to mitigate the impending doom for Jenny aside from get her into a foster home. If anything, that made it potentially worse, because of their lack of requirements for how Jenny needed to be walked and trained. 5.) This is something that I want changed personally: the public should be able to know how the shelter evaluates dogs for temperament (since this is a public shelter after all), and also what their guidelines are for determining a dangerous dog (if they don’t use the ones already set forth in current Municipal Code, which seems to be the case, because the definition for dangerous dog includes INJURY, which she has not caused.) If there is no such existing policy, and they are unwilling to put forth one, I suggest the residents of Seattle such as myself petition the Legislature to create such a document. I appreciate what you’ve done for Jenny so far but the fact is that you had 8 months to take her to a trainer and you didn’t. All this effort you’re putting into this social media blitz could have been used to actually make her adoptable by now. I also think that your campaign makes it seem like SAS is cruel and doesn’t care for its animals. This is so unfair .. not only to the staff but also to all the volunteers who put in many hours to care for the animals on a daily basis. The shelter placed Jenny with a foster family and did not deem her dangerous when they placed her. The foster family kept the shelter apprised of behavior issues and the shelter did not seem overly concerned. At any point, if SAS thought Jenny was a danger or needed more training, they could have transferred her to a foster family that was better equipped to give her training. But instead, they want to resort to euthanization. Those of us who volunteer our time with SAS do so because we love animals and believe that SAS does good work. Many of us have worked with dogs who have behavioral issues that need training. And we have see that work. It is (and should be) the very rare occurrence that results in the need for putting a dog down. The fact that SAS is so quick to resort to this (previously refusing additional assessments or an attempt at training) makes me, as a volunteer, lose faith in the organization that I have given my time and money to. The shelter PAYS to send the animal to training. All the foster parents had to do was to take her! They had 8 months to do this. 8 months! Nobody disputes your point. Yes, eight months has passed and Jenny has not been to any classes. She has had three 1:1 training sessions with SAS case managers, muzzle and body handling training with us, and the opportunity to interact with many different people — no small feat for a sensitive, reactive, fearful dog. Just because we didn’t take her to training doesn’t mean that we should have stayed quiet and allowed her to be killed. If you want training to be mandatory, you need to talk to SAS about changing their rules and how they communicate with foster families. We agree with you. It would be totally unfair to characterize SAS as cruel and uncaring. That is definitely not what we think. We have always had a good rapport with our case managers and the staff at SAS. Even the last very frustrating meeting with Don and Laura was civil. If you can be specific about which parts of the campaign you take issue with, we can review. If you read the timeline, you will see that we had no other way to keep Jenny alive without bringing the issue to the public. We tried every other avenue first. If we did not use social media to give her a voice, Jenny would be dead. You’re right about training, we had plenty of time to take her to classes. But that doesn’t mean that she hasn’t made progress or that she’s unadoptable. Jenny is reactive under very specific, manageable circumstances. With training, she would be more comfortable around other dogs and less sensitive to skateboards and motorcycles, etc. But training might not have prevented the two stranger air snapping incidents which are the greatest public safety concern to SAS. Those could have been prevented with experience, which we now have. Learned the hard way. Let’s be clear on one thing, many of the people who are campaigning to save Jenny’s life are volunteers, advocates, employees, and supporters of organizations like SAS or other worthwhile causes. This is not an offense on any on the dedicated individuals who give their time and efforts on a daily basis, we are among them. Attacking what you think is the unfairness of the situation based on the facts and circumstances here is one thing, but making this about a perceived personal insult to you is taking the focus off of the real issue. No one is disparaging SAS, but doing a lot of good work doesn’t equal making the right decisions all of the time. Even the best of us make mistakes that can have dire consequences. The full timeline of communications has been published on this website and discussed extensively in the “social media blitz”. You can see that there was an abrupt decision to euthanize Jenny based on the reports from the foster parents, who were then not given a chance to clarifying where their observations were misconstrued and used to justify the decision. Many efforts were made to speak up in Jenny’s interests and on their own behalf as volunteers before asking the community for help. This campaign is a request to SAS to be open to the possibility that they made a mistake and reconsider their decision by looking at all of the information more broadly, to respect the volunteers that they had entrusted to provide the expertise in Jenny’s case, and to acknowledge the legitimate concerns of the community. And of course, to let Jenny live. As mentioned above, Jenny would be dead if this campaign wasn’t launched to bring some community awareness and support to her circumstance. The alternative was to give up and send her to her death — I am sure that is not what you were suggesting. Grassroots organizing has long been a tradition in this country of helping the voiceless, is it not? To your point about training Jenny — let’s bring solutions and not point fingers. As a volunteer yourself, I am sure you know that it takes a big heart to open your home, resources and energy to a shelter animal, especially one that have been through abuse or trauma. That’s probably even more true of foster parents because without rights, they willingly provide a safe, loving environment while their foster animal awaits permanent placement. Even SAS in its efforts to recruit volunteers does not make it the obligation of the foster parents to provide training or “make them adoptable”. At a true no-kill shelter, that is actually the organization’s mission and responsibility. I’d also add that Jenny WAS considered adoptable by SAS at the time she came into their care. The only factors that contributed to the new determination were the reports of Jenny’s behavior given by Amie and Olli in hopes of identifying the right permanent situation for Jenny (i.e. an adopter that was equipped to provide permanent medical care and adequate training). Yet their attempts to clarify these reports (that Jenny is not dangerous) is being deemed irrelevant. Does it make sense to you that their opinions only matter if it leads to one particular result and not another? Under Amie and Olli’s care, Jenny’s has made progress in her social interactions, has been treated for her medical ailments, and has been regularly well-cared for — experiences that Jenny probably has not had for a very long time. The fact that they are literally fighting for her life right now is to be commended, not criticized. I truly hope for a resolution in their favor and think SAS can use this as an opportunity to gain a large number of new supporters as well. From my perspective in the child advocacy field working along thousands of volunteers, I’d say that in a different circumstance, Amie and Olli are probably the exact type of volunteers that SAS would not only want, but seek out, to be among their ranks. From the perspective of an animal lover, they are no doubt living up to the commitment they made to keep Jenny safe. And I would also say that from her perspective, Jenny probably agrees wholeheartedly too. Is there any chance that if you could get a lawyer to volunteer to write a solid contract that absolves the shelter of absolutely any liability for Jenny’s future behavior, that would work? I mean, fear of future litigation/other sanctions is really the motivating factor, right? If I were a lawyer, I would do it in a heartbeat. Please see the July 8 entry on our timeline. We offered to have a lawyer write a contract with the City addressing liability concerns. They refused saying that it only protects the City from getting sued by us, and not by others.